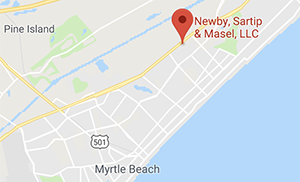 Organized in 1978, Newby, Sartip & Masel, LLC is a general civil practice law firm with a diversity of experience representing individuals and businesses. Our office is located at 4593 Oleander Drive in Myrtle Beach, South Carolina. We serve the coastal communities of North and South Carolina, as well as Florence and Columbia, SC. We assist individuals with various legal issues from Personal Injury or Accident, Workers Compensation and Employment Matters to Real Estate transactions, Trusts and Wills. And we can help Your Business. From Business Entity Formation, Planning and Documentation to Litigation, Debt Collection and Purchase or Sale of a Business, we can help. An important component of our practice consists of assisting individuals with the various legal issues that confront them daily. A large portion of our practice involves assisting clients with various business related transactions. We are actively engaged in all areas relating to the purchase, development, sale and financing of real estate in the rapidly growing coastal markets of northeast South Carolina and Brunswick County, North Carolina. We represent many regional hospitals and medical practices in their business related matters, including employment, corporate, real estate, debt collection and regulatory issues. We represent a wide variety of clients in all areas relating to the collection of unpaid debts. We have considerable experience drafting, interpreting and litigating contracts commonly used in the construction industry, including the complex interaction of the standard AIA document regime. We strongly emphasize our personal injury practice through Palmetto Injury Lawyers, LLC, a wholly owned business division that focuses exclusively on representing injured individuals. In all matters, our goal is to determine our clients' needs and help devise the quickest and simplest means of meeting them. Our lawyers practice civil litigation in both state and federal courts, and are licensed in South Carolina, North Carolina, Georgia, West Virginia and Florida. We represent both individuals and businesses, and are active in corporate law, land use regulation, residential and commercial real estate development and transactions, commercial litigation, contracts and leasing, collections, and business formation and acquisition.